Toebben Builders is always looking for qualified individuals seeking to join our team. Simply fill in the information below and we will respond to you promptly. 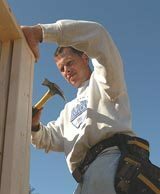 Toebben Companies also donates carpenters to work on Housing Opportunities of Northern Kentucky (H.O.N.K.) homes for low-income working familes who otherwise couldn't afford one. The Home Builders Association of Northern Kentucky is a corporate partner of H.O.N.K. and mobilizes the volunteers. Go to www.honkhomes.org for more information.